Guy Martin set the early pace at the Ulster Grand Prix as first practice sessions for Thursday's Dundrod 150 races started amid overcast conditions. 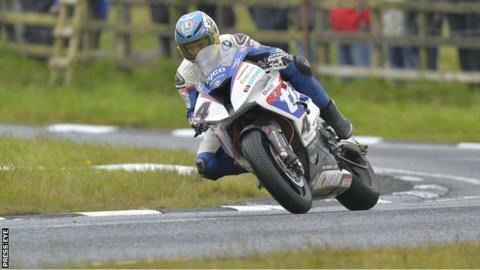 The 11-times Ulster GP winner from England clocked 116.121mph on his Tyco BMW Superbike, ahead of Connor Cummins and team-mate William Dunlop. Carrickfergus rider Glenn Irwin was fastest in practice for the Dundrod 150 National/Challenge races. Poor weather conditions led to an early end to Wednesday's practice. The weather is expected to improve and organisers are hopeful of running a full programme of events as planned. Cummins was second in Superbike practice on his Honda Legends Fireblade at 115.458 with William Dunlop lapping at 114.627 - Russ Mountford and Ian Hutchinson rounded out the top five. Earlier in the afternoon Irwin narrowly beat Conor Behan in practice for the National/Challenge races. Both riders set 109mph laps on their Supersport machines while Timothy Elwood, Robert Kennedy and Forest Dunn were the best of the chasing pack. Newcomer Horst Saiger was a respectable 20th, making his Dundrod debut in difficult weather. In Lightweight practice, Paul Owen led Seamus Elliott and Neil Kernohan, while Christian Elkin was quickest in the Ultralightweight session, with a dominant 100.726 lap. Practice for the Supertwins was then cut short as mist descended upon Dundrod, before the clerk of the course Noel Johnston made the decision to finish practice early because of the weather.